Here is selection of our most popular pop up products. If you do not immediately see what you want then please call us. We offer the full range of pop up stands so we hope that you will feel that our "One Stop Shop" approach will save you time searching for the best product for you. You are always welcome to get in touch. We look forward to hearing from you. Click for Magnetic Pop Up Exhibition Stands in 3x1, 3x2, 3x3, 3x4, 3x5 and custom CURVED sizes. 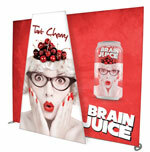 Ideal for exhibition displays, photo backdrops, conference sets, offices, schools, colleges. Lightweight. Counter transforms into a wheeled transit case which is also perfect for easy storage. A best seller for many years. 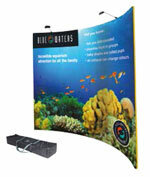 Click for 3x3 Curved Magnetic Pop Up Exhibition Stands WITH SCREEN BRACKETS. Devices to mount screens up to 60" and integrate into your pop up. Also iPad holders and smaller screens. FABRIC! 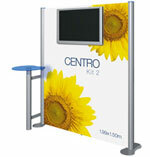 Click for Fabric Panel Pop Up Stands. 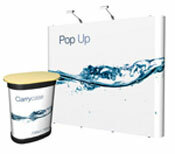 These lightweight pop ups feature a fabric graphic panel. The good news is that they fit into a carry bag, a little like a "sports bag". Ideal for lightweight travel. fast set up too. These have quickly become a firm favorite. Click for Magnetic Pop Up Exhibition Stands in 3x1, 3x2, 3x3, 3x4, 3x5 and custom STRAIGHT sizes. 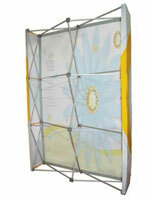 Ideal for exhibition displays, photo backdrops, conference sets, offices, schools, colleges. Lightweight. Counter transforms into a wheeled transit case which is also perfect for easy storage. A best seller for many years. Click for DISCOUNTED Pop Up Exhibition Stand Packages in 3x1, 3x2, 3x3, 3x4, 3x5 and custom straight and curved sizes. Starting at just £799.00 these packages are perfect if you need a highly flexible kit that will cover your needs in a variety of spaces and scenarios. Just re-arrange the component items to fit your space. At such a low cost this may be the solution you have been looking for. Click for Custom Pop Up Exhibition Stands and L-shaped stands to fit all space sizes. Extra Tall and Extra Wide. Towers as well. Heights up to 3.4m. Infinite widths with bends and curves. Tailoring and design service. We can design and create exhibition backdrops to fit your space. We can create structures between 70cm and 420cm high. We can also build to any width you want. 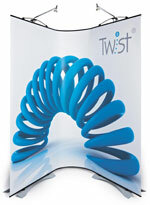 We can also incorporate bends, curves and waves into your stand. Single and double sided available. Free structural design on these products (conditions apply). Hybrid and L shaped stands a spcilaity. FABRIC! 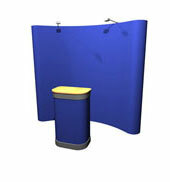 Click for Fabric Pop Up Stands in curved format. These lightweight pop ups feature a fabric graphic panel. The good news is that they fit into a carry bag, a little like a "sports bag". Ideal for lightweight travel. fast set up too. These have quickly become a firm favorite. Single or double sided. FABRIC! 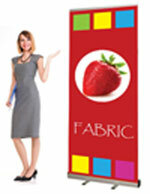 Click for Fabric Pop Up Stands in straight format. 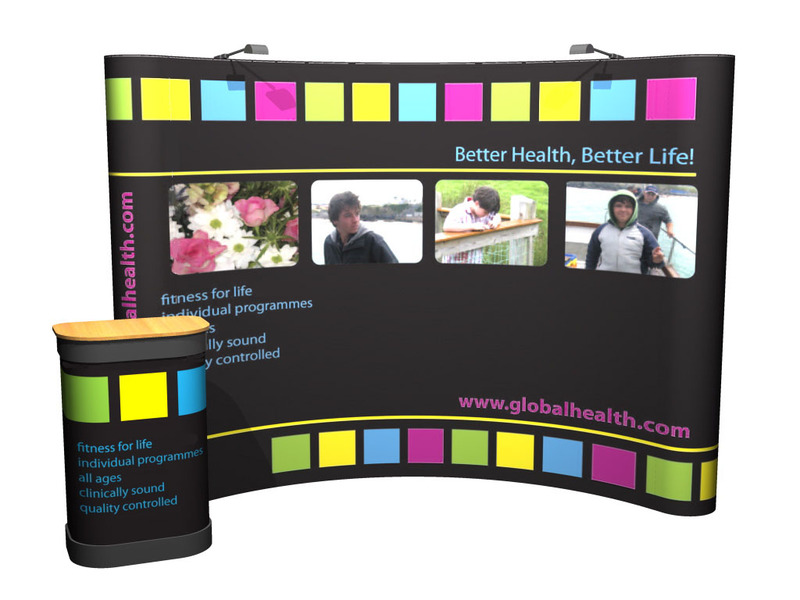 These lightweight pop ups feature a fabric graphic panel. The good news is that they fit into a carry bag, a little like a "sports bag". Ideal for lightweight travel. fast set up too. These have quickly become a firm favorite. Single or double sided. FABRIC! 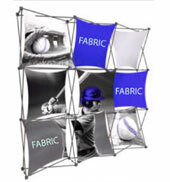 Click for Hop Up Fabric Pop Up system in 3x1, 3x2, 3x3, 3x4 and 3x5 sizes. The original fabric pop up. You can leave the graphic attached between events. Pull it out of the bag, extend the frame and lock off the locking arms and you are in business in way less than 5 minutes. Fast, easy, low cost! Click for Aero Banner System display system. A very popular alternative to other pop up systems. The graphic operates like a window blind. Easy to assemble. Graphics can be fixed at three different heights. Robust and attractive exhibition stand. Click for PopUp displays with screens. We have many different ways of integrating screens into our pop ups with solutions to hold a mighty 60" LCD. Click for Wave configurable flexible display system. A premium system with a unique ability to form waves. Just bend the system into the shape you want. Designed to be curved. A full range of accessories is available of course. Click for D400 Premium Pop Up display system. A premium exhibition stand system with a unique range of bolt-on accessories including shelves, carrier bag holders and screens. Can also be fixed together. Straight and curved options. Click for Pop Up Conference Set With Projection Screen display system. 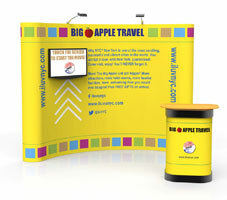 A clever pop up solution to save you money on a custom built set every time you hold an event that requires a screen. Very portable. Choose front or rear projection options. Re-use over and over again. Click for Pop Up System For Velcro . A Simply attach your posters with velcro. Peel on, peel of whenver you want. Ideal for art and photography exibitions, schools, collegs. Click for Pop Up Banners in sizes from 60cm wide to 290cm wide and up to 300cm tall. We are the banner stand experts. Over 200 different models and variations. If you do not know already then you will be amazed what can be achieved with the smart banner stand systems now available. Call us on 0845 470 0845 or visit our page. "For us, pop up stands have proved incredibly useful. We started off with one pop-up stand and initially, we just used it as a backdrop for our annual awards ceremony. It just sat on the stage and acted as a branding point. Since then, we have actually bought the second pop-up exhibition stand, which is kept in the office. It gets a lot of use internally and externally. For example we do use it for exhibitions. We try and book a shell scheme to fit the size of the pop-up rather than the other way around. But we also get a lot of use out of it now as we use it for branding our presentations both to our staff and to our customers - if we have enough space available. The pop-ups have been a great success and we would not dream of doing without them again in the future." "We purchased a D400 stand which we use exclusively for exhibitions. The thing we love about it is that we can attach the little paddle shaped shelves to hold a modest amount of our products. It is much better in terms of presentation as we just used to stack our boxes on the counter in front of us. We changed our logo recently so we just purchased a new sets of artwork panels and basically the stand looks like new again. We are generally very pleased with it and hope to get many more years of use out of it." "A couple of years ago we were looking for a flexible exhibition stand. We never take the same size stand twice, at least it seems that way. We also do a lots of hotel type events where you don't have any particular set space. The exhibition package has been pretty good. We always use the large curved module and then we can move the side banners about to fill in the spaces. or, if we don't have enough space, we just don't use them. Considering that the whole kit cost well less than £800.00 we are actually very pleased with the value for money that we have got from using it on many occasions. "We decided to use pop-ups for our pre-Christmas in-store campaign. For the 20 largest stores in which we were planning to promote our products we commissioned a pop-up stand with double sided graphics and a portable counter with shelving. Our field sales people found it reasonably easy to work with and set up time for two people was well within our target range. The display looked well above average for an in-store demo. The results seem to bare out that our investment in the 20 units was well rewarded when compared to the stores where we had a more modest display. We will certainly consider this as a part of our strategy going forward for in-store demonstrations and displays."